Colorful flowers brighten our landscapes, but don’t overlook interesting foliage that can provide season long beauty in containers. Add color and vertical interest to the shade garden with a container of coleus (Henna Coleus, Solenostemon scutellarioides ‘Balcenna’) and Rex begonias (Begonia rex-cultorum). Just set it among shade lovers. The fine texture of fiber optic grass (Isolepsis cernus syn. Scirpus cernus) makes a nice filler or trailer. The spikey red dracaena (Red Star Dracaena, Cordyline australis ‘Red Star) combines nicely with the yellow coleus (Gay’s Delight Coleus Solenostemon scutellariodes ‘Gay’s Deight’) and edible blue green leaves of Lacinata kale (Brassica oleracea ‘Lacinato’). The colorful croton (Codiaeum) ties it all together. A combination of reds, greens and purple make this an outstanding beauty. Sun loving coleus, sweet potato vine and variegated Plectranthus are a stand out combination in front of the blue spruce. The purple leaves and fruit of black pearl pepper (Capsicum annuum ‘Black Pearl’) provide a colorful bridge between the bold leaves of Mojito elephant ears (Colocasia esculenta‘Mojito’) and trailing sweet potato (Marguerite Sweet potato vine, Ipomoea batatas ‘Marguerite’). 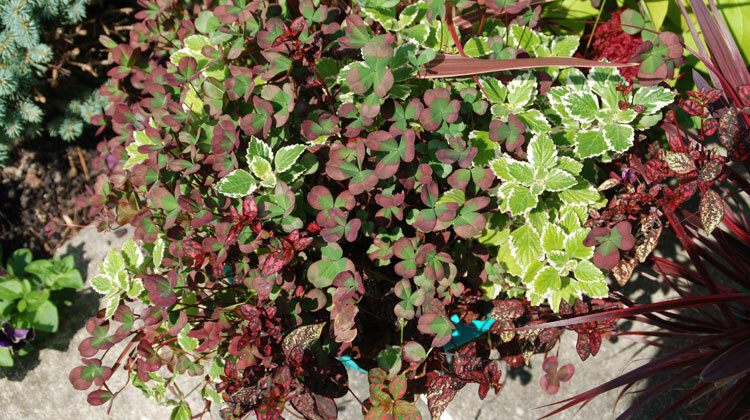 A bit more information: These plants are featured in the container with combinations of reds, greens and purple. The spikey Red Star Dracaena (Cordyline australis ‘Red Star) makes a nice vertical accent. The Coleus (Solenostemon scutellarioides), Fiber optic grass (Isolepsis cernus syn. Scirpus cernus) and Rex begonias (Begonia rex-cultorum) fill in the middle while the ornamental clover (Triflorum) cascades over the edge.